There is much about this CD that gives both emotional and intellectual pleasure. Alagna's singing, of course, continues to be appealing… but more about that later! The bonus this time around is the repertoire. It is no surprise to find arias such as "Je crois entendre encore" from Bizet's Les Pêcheurs de perles, "Ô souverain, ô juge, ô père" from Massenet's Le Cid, "Vainement, ma bien-aimée" from Lalo's Le Roi d'Ys, and "Nature immense" from Berlioz's La Damnation de Faust, even if they tend to smell a bit like old shellac records – does one think of modern tenors when one fondly remembers these arias? What is surprising is the unusual repertoire that this recital mines. Do you know François Bazin? Neither do I, but the Romance "Je pense à vous" from his opera Maître Pathelin (1856) is what opens this CD. Alfred Bruneau? "Le jour tombe, la nuit va bercer les grands chênes" from L'Attaque du Moulin (1892/3) brings it to a close. Luigi Cherubini is known for Médea, but when was the last time you heard anything from Les Abencérages (1813)? What about André-Ernest Grétry's L'Amant jaloux (1778)? Whether praise goes to the conductor, the producer (David Groves), or to Alagna himself for finding and including these rarities, the praise is deserved; these are vital, exciting arias, not just dull curiosities that lose the listener's attention as quickly as they attract it. Of course, this would all be for naught if Alagna were an incompetent tenor with a horrible voice. He is neither of those things. His voice retains its lightness and flexibility, so essential for this repertoire. The opening aria will have you comparing his voice to Pavarotti's, and not unfavorably, at the time of Big P's first records for London/Decca. Alagna remains a lyric tenor, but he has the power to sing with heft and heroism, when the music requires him to. Also, he always sings in idiomatic French, and he usually shows a good understanding for the music's stylistic requirements. Usually. One fault I've noted before is that Alagna frequently sings too loudly, and with too little variation of dynamics. Here again, he could make himself a more interesting singer by paying more attention to this area. Sometimes when he sings softly, particularly when he shifts into head voice, he turns croony, which isn't really appropriate either. His search for finding the dramatic truth leads him to unnecessarily break the vocal line with little sobs and heavings of the chest. I don't mean anything as extreme as what Beniamino Gigli used to do, but a little goes a long way. Apart from this device, Alagna's interpretations on this CD tend to be generalized. 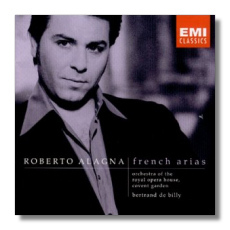 Finally, I'm not convinced by his ability to sing Classical and early-Romantic arias; the Grétry, Gluck, and Méhul arias are the least successful on this disc, only because Alagna does not seem at home with the style. I don't want to make too much of these weaknesses; this CD is a very fine achievement. The conductor and orchestra are amply supportive, and the presence of the London Voices makes for an effective "Vois ma misère, hélas!" from Samson et Dalila. The top-of-the-line engineering highlights the tenor – naturally. EMI's booklet thoughtfully includes texts and translations.